Okay, so who likes yogurt? I know do. Especially greek yogurt. I've recently become addicted to it. So rich and creamy. Mmmm. 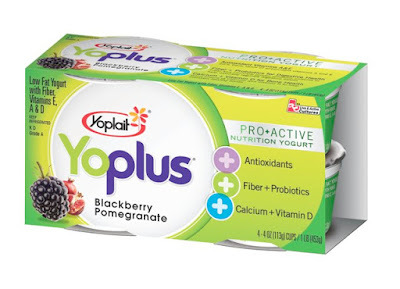 Recently I was contacted by Yoplait (and MyBlogSpark) to try their new flavors of Yoplait YoPlus yogurt. (Not exactly greek yogurt, but yogurt nonetheless.) They sent me a coupon to try it for free and also a "better for you" gift pack. I bought one of their new flavors—Blackberry Pomegranate. Was very good. I was surprised at how good it tasted, actually. It reminded me of a sweet blackberry custard. I couldn't taste the pomegranate seeds in there, but it had a hint of pom flavor in it. Each 4 oz container was only 2 points. It had 3 grams of fiber and 4 grams of protein, so it made a wonderful afternoon snack. It tied me over quite well 'til dinner. Okay, so here's all you have to do to enter the giveaway. Just leave me a comment on this post telling me what you're favorite healthy afternoon snack is. What ties you over until dinner? You can also enter by Tweeting your answer. 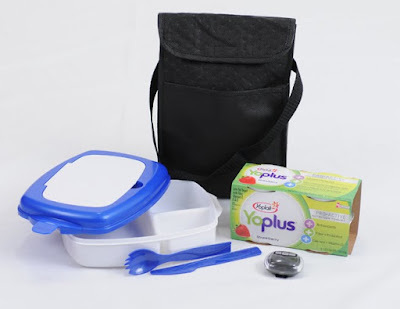 Just use the hashtag of #yoplaitgiveaway. My Twitter name is @mag_maker if you want to follow me. I'll pick one winner at random using random.org. The contest ends on Friday, Good Friday, the 2nd at 10pm. Until the winner is announced, here's a coupon for you to save $1.00 on one package of Yoplait YoPlus yogurt. My favorite afternoon snack has to be nuts. Usually walnuts or almonds. Just a few seem to be enough to hold me over. Yum. That lunch container looks awesome. When I have an afternoon snack, I like nuts, or maybe a cup of yogurt. My favorite afternoon snack has to be sugar snap peas....without dressing! Ooh, I hope I win! I've tried the YoPlus Blackberry Pomegranate, too, and I loved it. But I like that for breakfast. My favorite afternoon snack is probably a piece of fruit, or maybe some grapes with almonds, or a piece of string cheese... It really varies. I like to mix it up 'cause I can get bored with food pretty easily. My favorite afternoon snack is pistachios. You can have 25 for 2 points and they take a really long time to eat. My favorite healthy afternoon snack is fresh fruit :) *Thanks* for the giveaway! I like yogurt sometimes, but more often it's a banana. My favorite afternoon snack is simply fruit. I usually grab some grapes, a banana, apple, an orange...any fruit that I have in the house to nibble on in that long stretch between lunch and dinner. I've gottento where I look forward to my snack of fruit. Okay, this is going to sound funny, but something I like for a snack is Gerber Graduates Pasta Pick-ups, Chicken and Carrot Ravioli. It's actually a "toddler" food, but is only 70 calories and low in fat and sugars. A single serving bowl has a lot of pieces, and it's finger food which makes it feel more like a snack. You can microwave in the container or eat it at room temp on the go. Easy to carry. I actually had Yoplait YoPlus yogurt for a snack today (as well as some almonds). It was delicious. Thanks for the coupon!